It combines the night visit and the visit to the gardens. Mode that combines night visit to Nasrid Palaces lit and daytime visit to Alcazaba, the Generalife Gardens and Palace the next day. With the night visit you can get to know the Nasrid Palaces under special illumination conditions. This is the most famous and visited area of the Monumental Ensemble, composed of the following palaces: Mexuar, Palace of Comares and Palace of the Lions. There you can visit the Hall, the Oratory and the Court of the Mexuar. This palace is were the Nasrid sultans established the throne room and the residence of the Sultan and his family. It was built during the Yusuf I period, and his son Muhamma V completed its splendid decoration. It is accessed through two doors located in the Court of the Golden Room. Antechamber to the most important space of the Palace of Comares, its name may have come from the cylindrical shape of the dome, like an inverted boat hull, or from the Arab term al-baraka, repeatedly inscribed on the stucco of the walls. The Hall of Comares is located inside the tower and constitutes the largest room of the Nasrid Alhambra. During the second mandate of Muhammad V, in the second half of the fourteenth century, a major modification of the internal structure of the Alhambra is carried out. It is the most fecund nasrid period, when most of the spaces we visit today are decorated and redecorated. The residential area of the Palace of the Lions, located to the South, develop around the Hall of the Abencerrages. Noteworthy is the eight-point stalactite star of the Muqarna cupola that spreads out into eight trunk-like stalactites, also Muqarna. The Hall of the Kings is the most representative space of the Palace of the Lions. It was an area used for relaxation and leisure, structured around a large vestibular hall, that was reserved for receptions and celebrations. Likewise, this space is divided into three square-shaped spaces with the porticos and the alcoves in the centre. These spaces are perpendicularly segmented by large double stalactite arches. You enter the Ajimeces Gallery through a large archway opening in the wall. The upper part of the gallery wall is decorated with polychromatic stucco, while the lower part is bare. The name of gallery recalls the locks, fixed to the large side supports that the window pairs originally had. the Court of the Lindaraja appears behind a Muqarnas arch, culmintating the upper part of the premise by a fake cover with crystals of differet colours. From the 13th century onwards, the Nasrid people gave the Alcazaba its present appearance, adding great towers: the Tower of the Candle (Torre de la Vela) in the west and the Tower of Homage (Torre del Homenaje), the Broken Tower (Torre Quebrada) and Adarguero in the east, with the importan access through the Gate of the Arms. 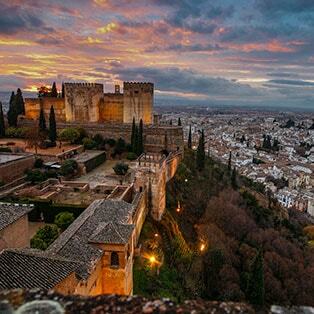 Access to the Alhambra is through the medina artisanal industry quarter, traditionally known as Secano or Dryland. The trajectory includes an archaeological tour of the Royal Canal’s start at the Aqueduct, the remains of shops with kilns, tanneries, and houses, as well as the inner wall and towers. On this tour the visitor will see from outside the wall one of four gates, the main one, known as the Gate of the Seven Floors. A stroll through this area will take the visitor past a wood of cypress trees trimmed in the shape of arches, the gardens nearby and the archaeological remains in the area. On the right there is a partial view of the Monastery of San Francisco, built in the 16th century over a small Muslim palace, which today is a Parador Nacional. On the left, there are the remains of various Nasrid houses, . A small pergola leads to a wide esplanade corresponding to the lower terrace of the Partal. To the left is the architectural structure for which the location is named: the Partal Palace portico. As is customary in these buildings, it is situated, like the Palace of Comares, on the premises wall. The portico, with its five arches, overlooks a large pool in the centre of the garden. Behind the portico is the main room, located inside the tower known as Las Damas. As we leave behind the Gardens of the Partal, we find the Palace of Yusuf III. Outstanding is the long pool in the central courtyard with a lush garden, structurally resembling the Palace of Comares . It is composed by the Lower Gardens, the Palace of Generalife and the High Gardens. It was divided in three parts, consecutively executed, that currently conform the New Gardens. The Generalife was used by the Muslim royalty as a place of rest. 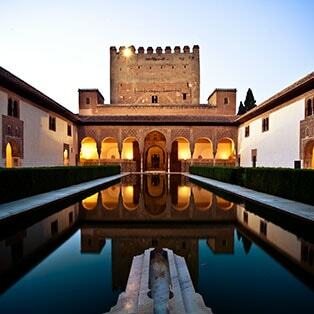 Built between the 12th and 14th centuries, the Generalife was used as a place of rest for the Muslim royalty. It was designed as a rural villa in the vicinity of the Alhambra. The Royal Canal (Acequia Real), the principal hydraulic source for the entire historical-artistic monument complex. The court channel was originally in the shape of a crossing, like the one in the Court of the Lions (Patio de los Leones), supplying water to four oblique parterres. The entrance is currently denominated the Court of the Dismount (Patio del Descabalgamiento) owing to the presence of footrests that facilitate horse riders in their dismount. Also on hand are two side buildings, which were probably used by stable hands. The second court is located at the top level. Entrance to the palace itself is through a tiny door, today partially hidden by undergrowth and embedded in traces of marble, with a tiled lintel and the ever present arch-key marking. From there, a steep narrow stairway leads to a residence, connected to the Court of the Main Canal (Patio de la Acequia), called the North Pavilion (Pabellón Norte), which in turn leads to an arcaded gallery, with five arches and bedchambers, and on to the Royal Chamber (Sala Regia) and the observation point of Ismail I. The Royal Chamber (Sala Regia) is noted for its plasterwork, niches and lovely stalactite capitals. The often repeated interior layout includes bedchambers framed by arches. Of particular note is the stalactite outset cornice supporting the ceiling. The arcaded structure dates back to 1584. In front of it is an intimate court and a garden with a baroque flare to it. EnTo reach the highest part of the Generalife you take the Water Stairway (Escalera del Agua), leftover—if substantially altered—from an earlier site, famous for its water, which flowed from the Sultan’s Canal through pipes in the walls. Water once flowed into three circular basins from as many pipes, now lost; however, water from the Royal Canal (Acequia Real) continues to flow down inverted pan tiles along the stairway parapets. This promenade was built in the middle of the XIX century as a romantic access to the Palace of the Generalife. Cypress Promenade, Secano(dryland), San Francisco Gardens. Booking and purchase of tickets are done online in the system of management and sales of tickets of the Council of the Alhambra, by telephone or on TVRs. These tickets can be purchased through “print at home”, on the TVRs or at the ticket office. The last procedure can cause an unnecessary wait. That all visitors must carry their entry, printed on A4 paper, obverse and reverse and keep it until the end of the visit. 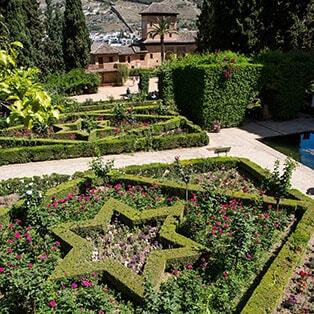 Please note that this ticket is valid for two consecutive days, offerinf the possibility of joining the night visit to Nasrid Palaces and the dayvisit to the Alcazaba, Gardens and Palace of Generlaife, the hext day. IMPORTANT: the date and the time of access to the Nasrid Palaces, is expressly written on the ticket. The visit to these spaces must be done within the specific time slot indicated on the admission ticket. Access to the Nasrid Palaces must be done at at the times indicated on the ticket. You are kindly requested to keep your flash turned off during the evening visit, since the use of flash bothers other visitors who cannot enjoy undisturbed their visit to the Nasrid Palaces..
With the ticket of gardens you can visit all the spaces of the Alhambra except the Nasrid Palaces. In addition, it will be possible to visit the place that has been designated “space of the month”, only if it is placed in the itinerary of this type of ticket. Mondays to Sundays: 8.30 h. to 18.00 h.
Mondays to Sundays: 8.30 h. to 20.00 h.